How Old Are Your Spices? Are you like me when it comes to spices? Digging through the jumble of your spice drawer is an archaeological dig of your culinary life: Oh, there’s that bottle of tumeric you needed when a Middle Eastern recipe called for 1/8 teaspoon — and you haven’t used it since. There’s the dip mix you bought at a friend’s home-selling party and the remains of your prolific sesame-seed bread-baking period. (Who knew you could get tired of sesame seeds?) There’s the souvenir pink Hawaiian sea salt you never opened. And what the heck is ground coriander seed anyway? Perhaps you need to do some spice cleaning. Or, you may have your spices neatly labled and constantly updated. If so, would you please come do that for me? I’ll even bake you some bread with sesame seeds on top! In the meantime, if you have McCormick spices of unknown age but you vaguely remember wearing shoulder pads when you bought them, go to the McCormick Web site — http://www.mccormick.com/Spices101/HowOldSpices.aspx — and type in the code on the bottom of the jars. Just be prepared. Apparently I still have a bottle of McCormick Chili Powder I bought when I had only the one child — and my second child is 22. Ouch. I do not want to find out what 23-year-old chili powder tastes like. I see spice-drawer cleaning in my very near future. This entry was posted in family, food and tagged cleaning, cooking, family, food, herbs, home, recipes, spices by Coffee with Cathy. Bookmark the permalink. Thanks for that link Cathy. I’m afraid to check some of my spices. Time does fly doesn’t it! 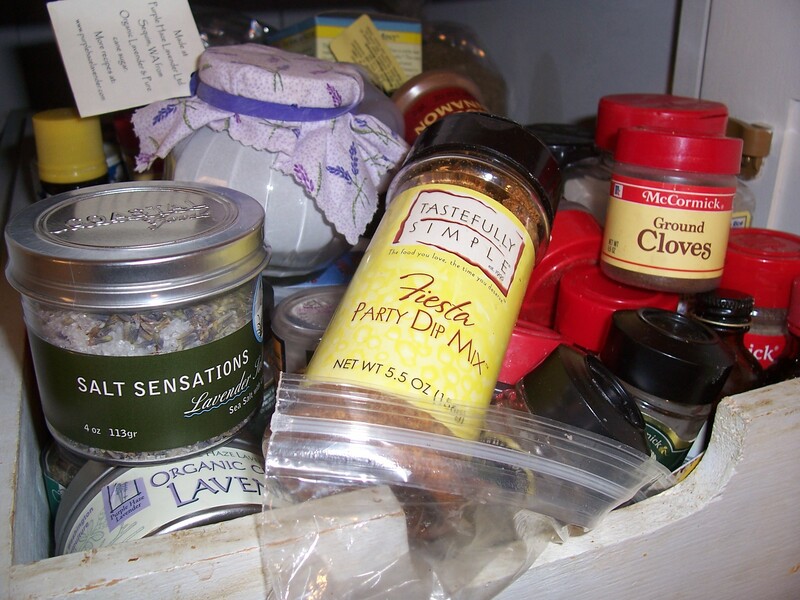 That is a great idea to clean out thoses spices with all of the holiday cooking coming up. I don’t know why they have to package spices in such large quantities. Even the smaller sizes take a long time to use up. Now I’m venting! I’ve never thought about cleaning out my spice cabinet. Not a bad idea for the next rainy Saturday in Tupelo. Glad I could help, ladies. Vent away! In there someplace may be Scary Spice. It is scary in there, that’s for sure! The one I’d be afraid of finding is Posh Spice. She never smiles. Oh, that would be scary, Ginny! You are so right.